Home Uncategorized Paul McCartney Plays Hollywood Blvd. The former Beatles plays a one-hour, 15-song set for 10,000 fans. L.A.’s king of the late-night talk show, Jimmy Kimmel, partnered up with Guinness to shut down Hollywood Boulevard yesterday. Commuters must have been infuriated but those who were lucky enough to be in the vicinity were treated to a live set by Paul McCartney. Before the concert, McCartney sat down with the talk-show host for an interview segment where he discussed the Beatles’ experimental, unreleased 14-minute opus “Carnival of Light.” Though fans have yearned to hear it for years, McCartney thinks it’s too “far out,” so don’t hold your breath. 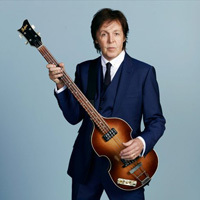 McCartney was performing in support of his latest album New, due out on October 15. For the Jimmy Kimmel Live taping, he played two songs, the title track “New” and “Lady Madonna.” But the 10,000 fans outside and those who tuned in for the MySpace stream got to hear a one-hour concert with McCartney playing a 15-song set filled with Beatles and Wings tunes. “This is good, innit?” he said. And it was. It’s awe-inspiring to watch McCartney. He’s a flawless performer who transitions between varying musical instruments while on stage and moves effortlessly among songs from throughout his career. You could feel the magnitude of the event; everyone in attendance was captivated by the performance. Between the tone-deaf buskers and the arguing costumed characters, harmony on Hollywood Boulevard is hard to come by but McCartney definitely brought it.